Who is stalking whom? All photos by Jeralyn Gerba. 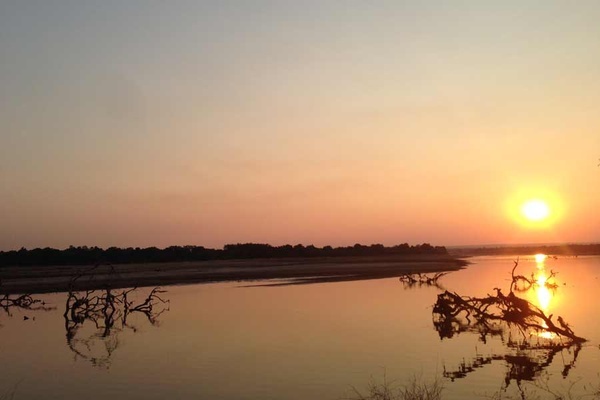 Gentedimontagna's Jeralyn Gerba goes on safari in Zambia to experience the best of planet Earth in 3-D. 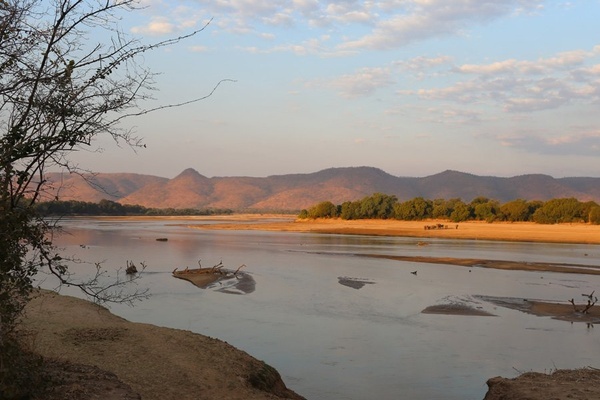 But it’s only day three on my safari in South Luangwa National Park, one of the most exciting wildlife sanctuaries in Africa. Less trafficked, less expensive, and a little more wild than Botswana and South Africa (where I went on my first safari), there’s no lack of impressive access to animals — as evidenced by the menagerie outside my room. And, I should add, I am not exactly roughing it. The alarm clock is a sweet and gentle “good morning!” from the staff singing outside my door. The bed, crisp white sheets and h pillows, is wrapped in mosquito netting nightly. Between the hot showers, daily laundry service, and gluten-free cakes at tea time, we pile into cushy Land Rovers driven by guides with knowledge of life as-we-city-slickers-don’t-know-it: bird calls, insect hideouts, animal tracks, big game mating rituals, sun orientation, water sourcing, foraging, and human survival in the great outdoors. My husband and I are on a very special trip organized by the adventurous guys at , the curatorial website for design obsessives, who occasionally customize adventures for 30 friends at a time. 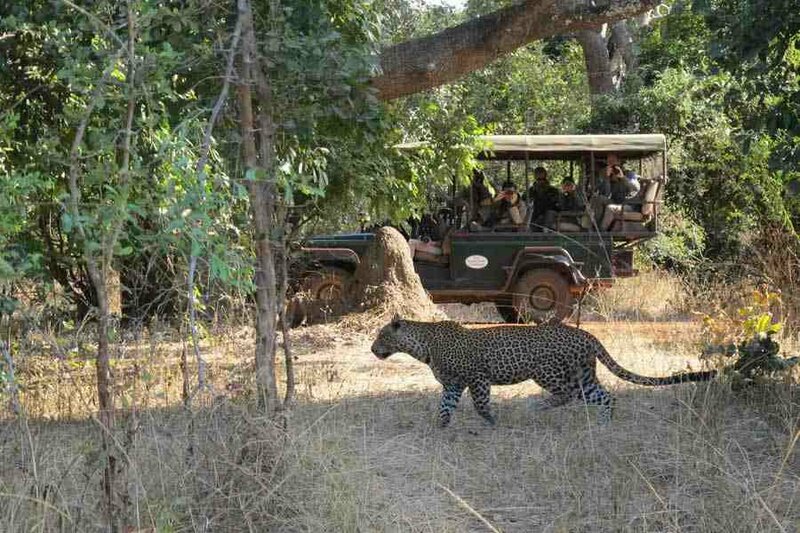 The ten-day safari in Zambia, organized in partnership with local operating outfit , includes surprises (cocktails and theater performance in the bush), activities (), and products (), revealed to us throughout our stay. 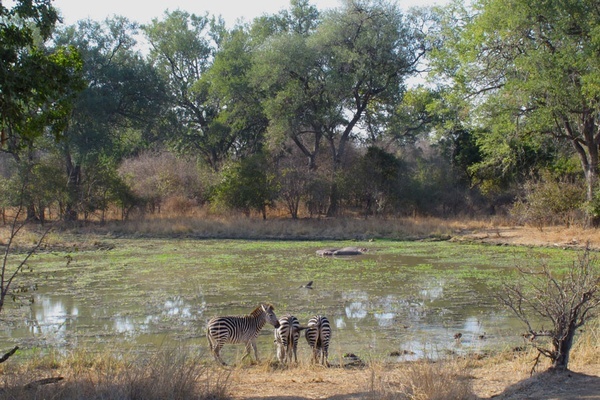 Zebras at the watering hole; lounging lionesses. The Bushcamp Company pulls out all the stops: One morning, we drive into a clearing to find a hearty English breakfast being prepared by a crew. The setup includes a hand-washing station, a chef frying eggs and sausage links over a fire, and a beautiful table set with cloth napkins and fresh-squeezed orange juice. On another evening, we watch the sunset from campaign chairs arranged in a semicircle in a river bed. Enormous African sun, stage left. Enormous mobile cocktail bar, stage right. A few days into the trip, we split off into smaller groups and trek deep into the bush, where, for a few nights, we settle into eight-person camps with names like , , and . Each one is uniquely designed with a communal outdoor dining room where, during siesta, we take meals together and play rummy and drink gin and tonics. 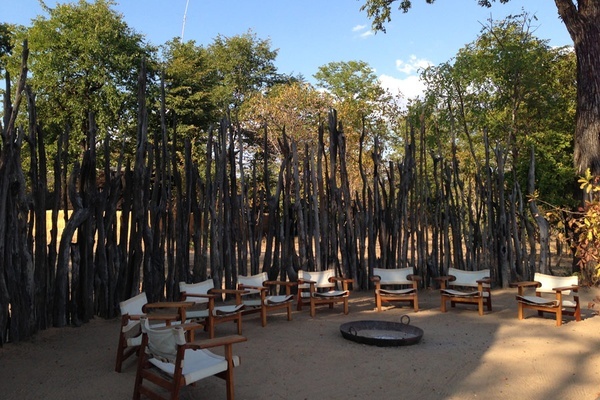 The camp managers and safari guides hang out too, which really takes their hospitality to a new level: We are ceaseless with our questions and they answer every (pedantic/mundane/tiring) request with charm and enthusiasm. Daybreak; finds from a walking tour; firepit lounge at Zungulila Bushcamp. Mostly, though, we hold on tight as the trucks cruise through flood plains and whip around wooded areas in search of animals doing their thing. We find an elusive pack of wild dogs with marbled fur making a den for their babies. We catch a beautifully patterned genet slink into darkness. We accidentally startle a lone, tusk-less elephant who sounds her trumpet and charges our truck. (We escape unscathed.) 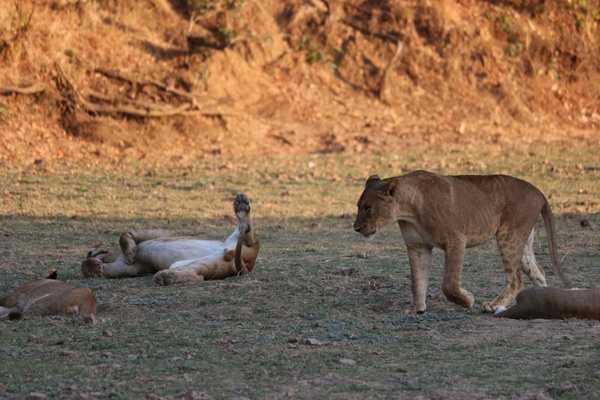 And we cannot stop watching the exhausting mating ritual of lions, who literally do it for days and days on end. Roar. 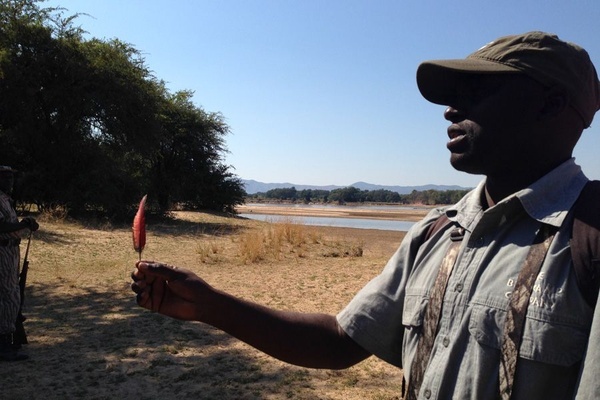 On walking safaris we learn about the mating rituals of kudu. The digestive tracts of elephants. The circulatory system of giraffes. The iridescent wings of the lilac-breasted roller, my favorite new bird. Each dizzying fact reveals the awesomeness of nature, the purposefulness of every zebra stripe, termite mound, poisonous berry, and vulture call. The interconnectedness of everything makes our early adopting, camera-toting crew seem like the real spectacle. Here we are, focusing our binoculars, uploading Instagram photos, pausing to apply sunscreen and Deet. We can’t detect a water source or find the hippo path to save our lives. And that’s what makes each and every excursion so incredibly refreshing and plain thrilling. The author and her husband; the unbeatable African sunset. Keep an eye on to hear about their next excursion.